Mac Rebennack strolled on stage at the Last Waltz to the words “You all know the doctor, Dr, John ? Mac Rebennack. Come on Mac !” And if you didn’t, well you soon did as he gave one of the highest highlights of that evening. This is another evening – Saturday, May 3, 2014 to be exact – which saw a similarly high profile bunch of musicians come together at New Orleans’ Saenger Theatre for a concert billed as “The Musical Mojo of Dr. John: A Celebration of Mac & His Music”. This double album presents the material from that night – Dr John’s songs, or other people’s songs that Dr John has helped to make famous. Starting with an all-time classic Right Place Wrong Time with the biggest guest of the night – Bruce Springsteen. Bruce does pretty well, but when Dr John joins in half way through it becomes crystal clear that this song needs that slightly sly and down and dirty phrasing that the good doctor more than anyone else is able to supply. Jason Isbell takes on Blow Wind Blow triumphantly, and Warren Hayes rocks You Lie with aplomb whilst John Fogerty is well within his comfort zone on a funky New Orleans. Like most such concerts – and albums – there’s a mix of the great as well as a leavening of the not so great, but it serves as a reminder, if such is needed, of the magnificence of Dr John’s repertoire – rolling from the jazziest jazz to the rockingest blues to the funkiest rock and beyond. I walk on guilded splinters, sung with Sarah Morrow, is superb, oozing along with a sinuous beat – it’s also, surprisingly, the only song off Gris-Gris to be featured. Rarely can closing out with Such a night have been more appropriate – Dr John sounds wonderful and it must have been a hell of a gig to have been at. There’s so much to enjoy, but, you know what? Dr John, himself, is, sure enough, the best thing on the album. 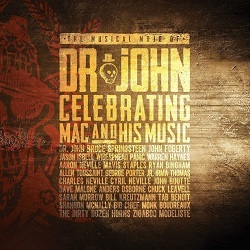 Star studded celebration of Dr John and his music, with the main man adding some essential tracks. A great live album – no jive.